September 6, 2017 - Financial Checkup: Are You Maintaining a Healthy Financial Life? 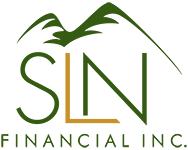 | SLN Financial, Inc.
September 6, 2017 - Financial Checkup: Are You Maintaining a Healthy Financial Life? No matter what life stage you’re in, knowing your financial health is important. Just as a regular checkup with the doctor will give you insights on your medical well-being—and any course corrections you should take—so, too, will doing a checkup on your financial life. 1. Use or revise your budget. If you’re not yet using a budget, begin to do so today. You’ll gain a clear picture of the essential items (like your home mortgage) you’re spending money on versus the nonessential items (like going out to eat). From there, you can know how much of your finances goes to which bucket and make a strategy for controlling your spending. By doing so, you can improve your saving habits and be better able to support your retirement lifestyle and needs. 2. Check your insurance coverage. Life can change at any moment, often affecting the insurance coverage you need. You may have gaps that could wind up draining your finances if you had to address any unexpected events that come your way. On the other hand, you may be paying for more coverage than you currently need, if your circumstances have changed since you last purchased insurance. Perhaps your children are grown and you’re ready to retire; if so, you may not need the level of life-insurance coverage you did when raising a family. Or maybe you’re nearing retirement and realize you don’t have long-term-care insurance in place to help you with healthcare costs should you need support in your later years. By taking the time to revisit the protection you have against what your current and future needs are, you’ll help maintain a healthy financial standing. When addressing your financial life, a variety of factors will affect your health or risks—and determine the best strategies for your goals. If you would like to schedule a financial checkup, we’re happy to help. Please contact us today.